If you’re looking to set up a new home theater system, then it’s a well known fact that projection technology is the best way to recreate the movie theater experience in the comfort of your own home. 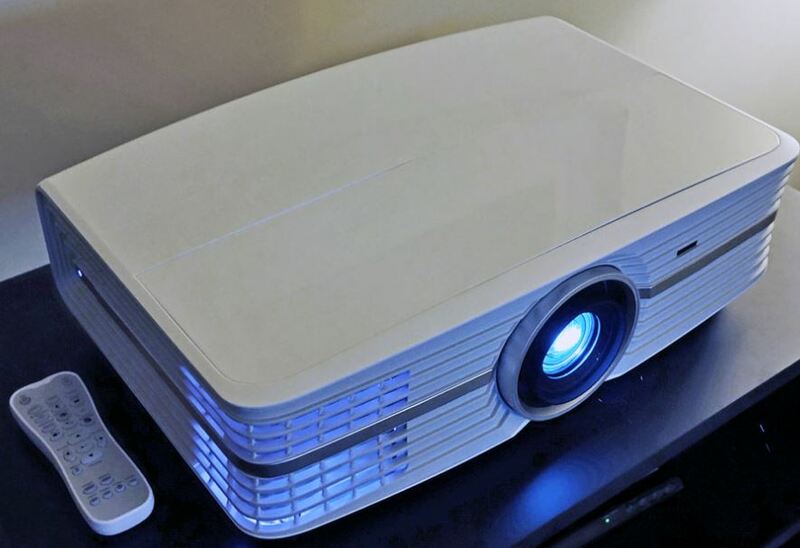 If you’re on a tight budget, 1080p projectors provide the best bang for your buck. But if you want to go all out, then a 4K projector is the one piece of hardware that can help you build the ultimate theater room. Just a few short months ago, 4K projectors were far and few in between. Projection technology tends to lag behind televisions, and 4K has only recently become affordable for the average consumer. Optoma is known for being one of the most affordable brands, and their UHD60 4K Ultra High Definition Projector promises to offer top-tier performance at a price lower than the competition. 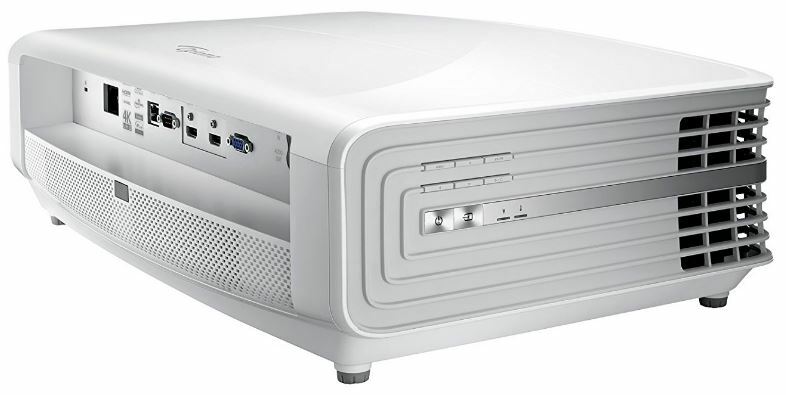 In this review, we’ll be going hands on with this hot new projector. We’ll find out how it performs, and help you decide if this projector should be the centerpiece of your new home theater. From a tech perspective, this projector seems to offer everything you could possibly want. It’s got a true 4K resolution, clocking in at 3840 by 2160. It features both REC 709 and REC 2020, offering support for HDR content. Combined with an advanced optical system and plenty of controls, there are very few features you won’t find here. But as we all know, the specifications only tell part of the story. The only way to tell if this projector is as good as it seems will be to test the real world performance. From the moment you take it out of the box, you can tell that the UHD60 is a cut above your standard projector. The large lens is front and center, accented by a silver stripe and cooling grills. The top of the projector is flat and finished with a glossy material, and the edges are gently tapered to give it a more rounded-off appearance. You won’t find any controls on the projector itself. This system is all digital. Tucked in the back you’ll find a compact cut out where all of your ports are. Keeping the ports in this recessed bezel makes it easy to manage your cables. Even if you’ve got five or more wires coming out the back, you’ll be able to keep them neat and orderly so you don’t have a rats nest of wires going everywhere. One of the most frustrating parts of getting a projector up and running is finding the correct placement. You want the display to fit within the margins of your screen. Unfortunately, you’ve got to work within the limitations of your optical system. Luckily, Optoma’s optical system is a cut above the rest. It has 1.6x optical zoom, so you have more flexibility between placement and display size. You also get a variable throw ratio of 1.39 to 2.2, and vertical lens shift. The end result is that you can place this projector anywhere in the room you like. Mount it to the wall, place it in the center, or tuck it away in the rear. No matter what option you choose, the advanced optical settings will still give you the display size you want. For video and audio, most of you will be connecting video sources that use HDMI. Optoma provides you with two HDMI ports, both of which support HDCP 2.2. This allows you to watch copyrighted content, and provides the 18 GBPS of bandwidth required for UHD and HDR content. If you’re using this display with a computer, you’re also provided with an HDMI port for video, and analog audio (both in and out) through the 3.5mm ports. This is helpful for connecting external speakers, or providing pass-through audio when necessary. Optoma supports integrated devices, such as media streaming sticks. They provide a USB power outlet to supply the 5V these devices need. For home theater automation, there are two ports provided. Simple systems will use the 12V output on the back. This connects to your motorized display. When the projector is on, the display will roll down. When the projector is off, it will retract. For more advanced systems, there is also an RS232 serial port provided. This allows it to sync up with more advanced controllers that automate your lighting, video sources, and any other automated components in your home theater. There is no doubt that 4K is the next big thing in cinematic technology, but it’s important to consider the relationship between size and resolution. A 20 inch 4K screen is significantly more detailed than a 60 inch 4K screen. But the question is, how much detail do you need? According to some, the benefits of 4K are visible with a 50 inch screen, when you’re sitting 5 feet or more from the screen. The point where a 4K screen will be noticeably better quality than a 1080p screen is around the 90 inch mark. With this in mind, the large screen provided by a projector is the best way to appreciate 4K. So although this projector will work with smaller screen sizes, in order to really take advantage of everything it has to offer you’re going to want to bump it up towards it’s upper limit of 140 inches. Thanks to built-in optical zoom, you don’t have to have it placed very far away from your screen to get a large image. At 13 feet away, you’re able to get a 130 inch screen. The required distance drops dramatically as you move down in size, so you’ll be able to pass the 90 inch threshold quickly and easily. Although resolution is often the selling point for most video playback devices, we’ve always found that it’s the color and brightness that really make a difference. And in both regards, this projector is well above average. It produces 3000 ANSI lumens. Most projectors won’t give you the ANSI measurement. The difference is the ANSI lumens is a measurement of the light that actually hits your screen. A non-ANSI measurement is only the brightness of the bulb, and doesn’t consider the light that was lost through the optics. The end result is a screen that can be comfortably enjoyed, even in the daylight. This is still an indoor projector, and daytime use outdoors will be subpar. But even if you’ve got the lights on and the blinds open in your movie room, the screen will still be clear and easy to see. In the color department, this projector is no slacker either. It’s capable of producing the full range of HDR images. It’s fully compliant with REC 2020, which ensures that the colors are accurate, and presented exactly the way that your movie producer intended them to be seen. One of the biggest problems we come across with HDR displays is how they display non HDR content. Some displays choose to use a form of upconverting, which makes non-HDR content look like HDR content. However, most consumers find that this is inaccurate, and a poor representation of the true video. But Optoma made sure that this projector was calibrated for REC 709, so it’s also accurate on non HDR content. The only feature we’re missing on this projector is 3D. 4K content is the perfect candidate for 3D. 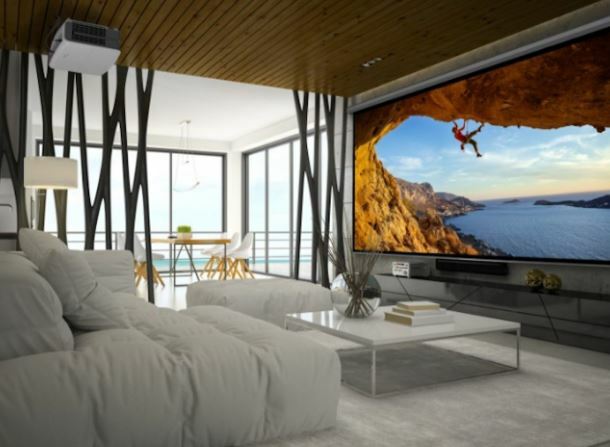 With televisions, you lose half the vertical resolution when watching in 3D. But with 4K, there is resolution to space. In this case, you can watch 3D content and have no perceptible loss. But 4K projectors are still a budding technology, and this is one of the few areas we found this projector lacking. Overall, there are a lot of advantages to the Optoma UHD60. As far as 4K goes, this is still the best bang for your buck out there. If you’re looking to make an investment that will last for many years, this would be our first choice. 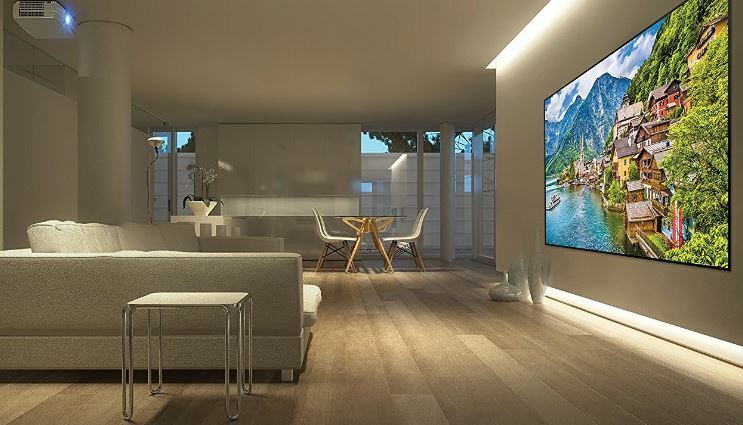 4K is still a reasonably new market, so ensuring that you get a projector like this that is up to date with all modern standards will ensure that when technology changes, you’re not going to be left out in the dark. Not quite ready to make the 4K plunge? In this case, you might want to check out our review of Optoma’s HD29 Darbee Home Theater Projector. Although it only produces 1080p video, the projector is much cheaper, and it still has a lot of the features we liked about this model. But if you’ve got the money, the UHD60 will playback both 4K and 1080p content in high quality, in a variety of environments. No matter how your home theater room is set up, this is one of the few projectors that will adapt to meet your needs.